The new stark Naked range of wine kits from Muntons has got to be the best wine kit ever produced in the history of home brew. 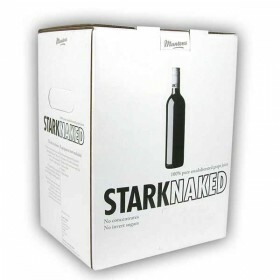 The Stark Naked wine kit makes just 15 bottles and requires the addition of nothing !! Really... not even water ! It's true, the Stark Naked range are made of 100% pure unadulterated, non-concentrated single variety grape juice from a named vineyard. And the news gets even better, bored with the mundane merlot, and all of the other old kits ? Stark Naked have introduced 3 new varietal wine types to the home brew range - Soave, Gammay, and Barberra, as well as upgrading the old favorite - Pinot Grigio. The very pinnacle of Home Wine Making. A very high quality wine kit indeed. The Stark Naked Gamay wine kit makes 15 bottles of the most won..